From shear walls and retaining walls to precast, ICF, and tilt-up walls, engineers worldwide use spWall (formerly pcaWall, PCA-Tilt, TILT) to optimize complicated wall design, reinforcing, and deflections. spWall, formerly pcaWall/PCA-Tilt/TILT, is a program for design and analysis of cast-in-place reinforced concrete walls, tilt-up walls, ICF walls, and precast architectural and load-bearing panels. Upgraded to ACI 318-11, it uses a graphical interface that enables the user to easily generate complex wall models. The geometry of the wall (including any number of openings and stiffeners), the material properties, the loads (point, line, and area), and the support conditions are assigned graphically by the user. Also, springs (translational and rotational) can be graphically assigned at any node. The program is based on the finite element method and can take into account second-order effects. The wall may include any number of openings and stiffeners. 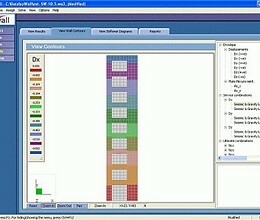 The amount of steel required for flexure is computed based on the selected design standard, and the user can specify one or two layers of reinforcement. 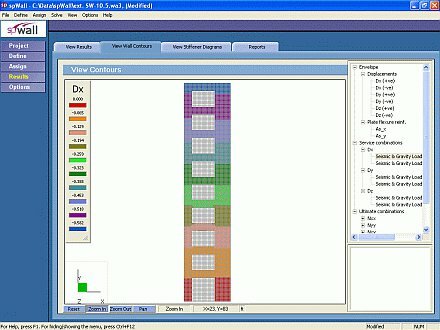 The program calculates the required amount of reinforcement in the plate elements and stiffener elements based on the code selected by the user. For solid walls, spWall can also compare cross-sectional shear forces with calculated in-plane and out-of plane shear strength provided by concrete. * spWall download link provides trial version of the software. spWall has been rated 5.0 out of 5 points. A total of 1 votes cast and 0 users reviewed the software.